Listening to theorists, rather than practitioners, isn’t going to get it done. Reading a few articles isn’t going to get it done. Daydreaming, without actually doing, isn’t going to get it done. If you want to build the business and lifestyle of your dreams, then you need to take the first step. You need to take the first step toward learning from people who are actually out there building amazing businesses and lifestyles through the scalable power of digital products and services (and not just talking about it). Which is why we’re inviting you to come take one very easy step with us over at Digital Commerce Institute, to get a sample of how we’re able to help you build the business of your dreams. No charge. Registration is free. And the value we’re offering might surprise you. 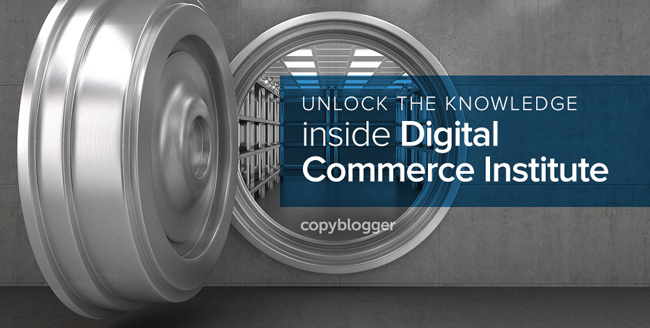 In addition, you’ll get valuable “how to” articles and case studies of successful digital entrepreneurs, plus all of the Digital Commerce Academy content we designate as free in the future. All you have to do is click here, enter your first name and email address, and you’ll have instant access to everything described above. this is really exciting being a young entrepreneur and with very Little experience I was desperately needing such kind of advice from an experienced person. Thanks for such activities. I am in. You’re welcome, Ankita. There’s a lot in there, so enjoy exploring! I became knowledgeable through your free stuff at copyblogger. Your free Ebooks are trustworthy, authentic, and up-to-date. I like your new incentives at DCI. I just come to dig in more wisdom. Thank you all SO MUCH for this. I am so elated to receive limited materials from Digital Commerce Institute! I am now so happy that I will probably get no sleep at all for DAYS. I have absolutely NO WORDS AT ALL for how happy I am about this free offer! Copyblogger has been such an incredible resource for me already. It has helped me with so many content marketing tools and tips, and am better content writer for it. I cannot do without you guys. And, with every type of business migrating to online platforms, who doesn’t want to be a digital entrepreneur? This looks as good a learning platform as any. Besides, i will take freebies anytime! Have already signed up. Thank you Patrick! Just remember to not treat them as freebies. 😉 This is extremely valuable content that will be well worth your time. Make sure you dig in and engage with materials.